So I made one of those permanent decisions recently. I got tattoos. Finally! But I thought since I got them in Latin, and Latin is all mysterious and what not, I should probably explain a little. So here’s that. What I also love about this is that the meaning becomes deeper each day. It also serves to remind me that grace comes first. Just like the legal aspect of anything always has to come first. You walk into a bank and what’s the first thing they have you do? Fill out paperwork. You go to school, what do they make you do? Paperwork. Just like legality comes first, Jesus grace comes first. I don’t need to sin just to receive grace. I have received grace first, so therefore I flee from sin. On my right foot I have something similar (but completely different) tattooed. 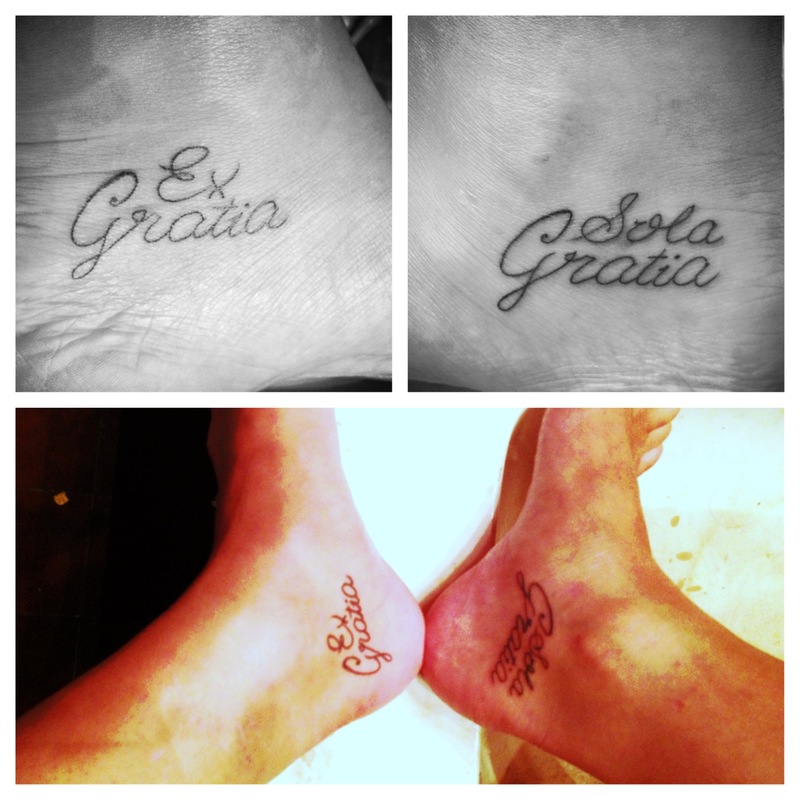 It reads Sola Gratia. This phrase is one of the five solae propounded during the Protestant Reformation. This phrase means “by grace alone.” This is also something I need to be reminded of daily. I have struggled tremendously in the past with both extremes of legalism. I have thought that doing everything right will save you, and I have thought that nothing that I do matters because I have grace. Both of these are lies, and hopefully that is evident when they are written out. However, I have also struggled with this middle ground issue. I hope someone can relate to this. I struggle with believing God is a god of karma. Now, don’t worry, I am not going all new-agey on you. Although I will realize in my head that there is nothing in my power that I can do or accomplish or say that will save me or save anyone else, I often struggle with thinking that accomplishing more things will make God happier with me. Therefore, I think God should bless me. It is a simple, small lie with catastrophic and far-reaching implications. This tattoo reminds me that I cannot put God in my debt. God will never owe me anything because everything is already his by grace alone. Together, these tattoos remind me that I belong to God. I am marked forever, and not just on my body. This is something that Satan uses against me, so I’m going to literally wear my struggle. Battle with me. This one particular line often flutters around in my head. My conscience uses this lyric on me constantly. It reminds me of Romans 6, which is such a difficult yet profound chapter of scripture. For those of you who are not familiar with this chapter, the beginning goes a little something like this, “What should we say then? Should we continue to sin so that grace may multiply? Absolutely not! How can we who died to sin still live in it” (Romans 6:1-2)? Those two verses kill me sometimes. The most common lie the devil likes to tell me is this: “It’s okay. Just see what this is like. You can have grace later.” Romans 6 absolutely destroys this lie. So many times in my life, I have done things while thinking “I can always be forgiven later.” This is a terrible aspect of the human condition, but it is remarkably real in my life especially. Going back to that Needotbreathe lyric. “Grace she comes with a heavy load / Memories they can’t be erased / Like a pill that’s swallowed that makes me well / But leaves an awful taste.” Grace cures, but memories don’t just die. Yes, I 100% believe that I have been forgiven for everything I have done, am doing, and will do. However, just because I have been forgiven of those things doesn’t mean I don’t still think about them. Even once the guilt and shame have been overcome through Jesus’ grace and forgiveness, there are still the memories of the things that I have done. I am not the same person because of things I have said, my mistakes, and choices I have made. Sin isn’t an idle thing. Sin isn’t just something that you do that you need forgiveness for. Sin eats you alive, even after the actions have ceased. Sin destroys you. Sin changes you. Sin makes you see people differently. Sin makes you see God differently. The deeper you get into sin, the more grace you may receive, but the more difficult it is know what is true and what isn’t. Sin is darkness. Lies are darkness. One cannot focus on truth while living in sin. We say we have died to sin. Although, people still makes mistakes, and though we are all still growing and learning, sin is not something to be teased. Don’t play around with it. Sin is death. God meant that when he said it. God is not trying to limit your life or keep you from doing things. God doesn’t want you to be hurt by your sin. God doesn’t want to see his children die from the inside out. God doesn’t want to see darkness take over you. God wants your life to be abundant. John 10:10 says, “The thief comes only to steal and to kill and to destroy. I have come so that they may have life and have it in abundance.” God’s rules are not legalistic. God’s rules are to make your life more abundant. I know from personal experience that this is true. I have lived many years in darkness. I have returned to that same darkness many times, and each and every time it becomes more difficult to escape. Grace becomes harder and harder to swallow the more we live in sin. I am not saying that not sinning will make you happy all the time. I am saying that life will be much more fulfilling without sin and without the memories of sin. God’s grace is beautiful. Just be careful not to sin with the thought that grace will follow. If you’re thinking about grace before the sin, you know better. Mistakes happen. Just don’t abuse God’s grace. It will only leave you empty and hurting.